Much like other business disputes, partnership disputes can be quite complex and varied. A partnership dispute may result from disagreements regarding the aims and direction of a business. Other partnership disputes may allege that one partner is not properly executing their duties. Fiduciary duty violations may also become intertwined in a partnership dispute stemming from allegations that a partner, member or shareholder has breached his or her duties of loyalty, care and the contractual duty of good faith and fair dealing owed to the business and other partners, members and shareholders. These are a just a few types of the partnership disputes that our Chicago business litigation attorneys might encounter. As an added degree of complexity, a partnership dispute also can vary as to whether it includes general partners, limited partners or some combination of the two. 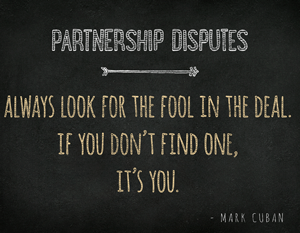 For this reason, any partnership dispute requires a level of care and consideration. Our business litigation attorneys also understand that a partnership dispute can be quite a personal affair, often affecting personal friendship and professional ties. We thus make our mission to address partnership disputes swiftly and efficiently, so that our clients can return to managing their business affairs and protecting their personal interests. A partnership is established when two or more individuals agree to carry on any business activity as co-owners. The most important factor to determine whether a partnership has been established is if the individuals agreed to share in the profits and losses of the business. In Illinois, the Revised Uniform Partnership Act (RUPA) provides a default set of rules that partnerships must follow. Many business partners often choose to formalize their relationship by through written partnership agreements. Regardless, partners are bound by the Partnership Act and any written or oral agreements governing partnerships. Our Chicago partnership dispute attorneys understand the importance of respecting these rules and can protect the interests of partners seeking to enforce them. The written contract between business partners should be the first legal instrument that a client considers when seeking to resolve a partnership dispute. A written legal agreement will often contain contractual provisions to direct how to business is to address a particular issue and the available remedies to resolve the dispute, such as seeking equitable relief through mediation or arbitration. It is very important to seek legal counsel in the event of a partnership dispute. While some legal agreements may be provision how to handle a certain situations in relatively straightforward terms, most circumstances will still require the legal experience of a business litigation attorney to properly interpret the legalese contained within the legal agreements and develop an appropriate solution. If you are having a partnership dispute or believe that you may become involved in a partnership lawsuit, please contact our Chicago law firm to inquire about your dispute. You may also call one of our attorneys directly at 312-789-5676.